You may be thinking that my RC power supply article here is only intended for people who need ample amounts of charging power, but that is not the case. 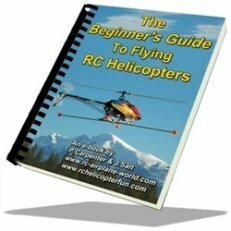 The thrust and underlying messages of this entire write-up are focused on saving money, flexibility, and electric powered RC "growth"; from the electric powered RC newbie right up to the most experienced and power hungry RC guru. As you'll soon see in the computer server power supply review below, I was fortunate enough to have found a wonderful and economic power supply solution to cover this entire spectrum. I have been getting many power supply sizing & recommendation questions lately, and I hope this article and review helps answer most of them. Before getting to the review, I thought I should just go over some RC power supply basics if you don't really know much about them. Of course if you do, please feel free to skip down the page right to the computer server Modular Power Supply review. 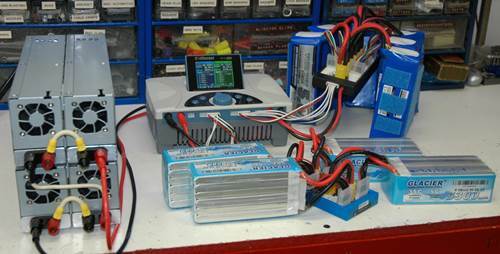 An RC power supply is needed to power your RC battery charger/s. They basically convert AC voltage & current from a household outlet to clean and steady DC voltage & current to power your RC battery charger. 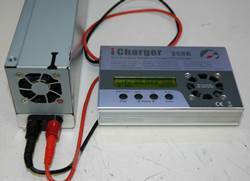 Some lower powered RC chargers come with built in power supplies, but once you get past a certain charging power level, you must start using separate stand alone power supplies because of the size increase. Power supplies (PS for short) come in all sizes with different voltage and maximum current output ratings depending on your needs. Generally, when deciding on a specific RC power supply, you pretty much have to know what RC battery charger (or chargers) you will be using with it so it's capable of providing adequate power. My page on RC battery chargers goes over all that and what to look for in a charger and how to know you are getting a charger powerful enough for your needs now and down the road. I have been traveling down this electric powered road myself now for the past 9 years since switching from nitro power to LiPo power and I've learned two important and fundamental lessons during the journey. 2. At this stage, you find yourself purchasing not only more computerized battery chargers but more powerful ones to handle the ever growing work load for faster charging (less time charging = more time flying and driving for more enjoyment in the hobby). The obvious outcome as your charging needs grow, so do your powering needs. What I learned however is power supplies soon start to become one of the largest single expenses in this electric growth game. Every time I got a new more powerful charger, I also had to shell out at least as much or more coin to get a more powerful RC power supply to power it! Not only that, once past the 1000 Watt realm, the RC power supply issue finally became the financial show stopper for me in relation to the fairly reasonable price you can get very powerful computerized RC battery chargers for these days. Growth spurt over! 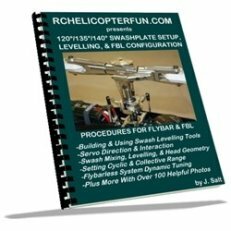 So what's an electric powered RC'er to do? Wouldn't it be nice if you could just increase the power (both voltage and/or amperage) of your RC power supply the same way you could increase the memory on your computer by simply and economically installing more memory? Well now you can thanks to a modular computer server power supply solution. 2ZO-RC is no longer building these awesome modified server power supplies for modular RC usage. That said, here is my page that shows how you can easily & economically make your own modular power supplies, just like the 2ZO-RC ones. I still encourage you to understand this page first so you know what power supplies are all about, and why these modified server ones are such a great option. Only after understanding them, will you know if building one is something you would like to do. My converted server computer RC power supply story starts shortly after getting the iCharger 4010 Duo charger. This is a feature rich 2000 Watt power beast of a charger which deserves its own dedicated review, but let's stick with the topic at hand. I was at first powering the 4010 Duo with my 1000W 24V Meanwell power supply. It worked, but I could only use the 4010 to roughly half its capacity. To get the full meal deal out of this bad boy, I needed an RC power supply that could deliver 50VDC @ a minimum of 40 Amps and supply at least 2000 Watts of power. I started searching for power supplies that could accomplish this and almost had heart failure in the process. Not only are 50VDC 2000 plus Watt power supplies fairly rare and expensive (most well over $500), they also need a 240VAC power source meaning I would also have to run a dedicated 240VAC line to my charging area in the workshop - it was a huge expense that I couldn't justify (to myself or the wife)! 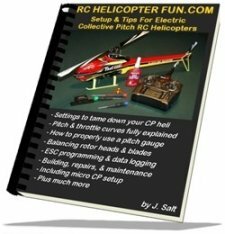 At this time, I was fortunate enough to get an email from a very nice fellow by the name of Mike with an RC helicopter question. 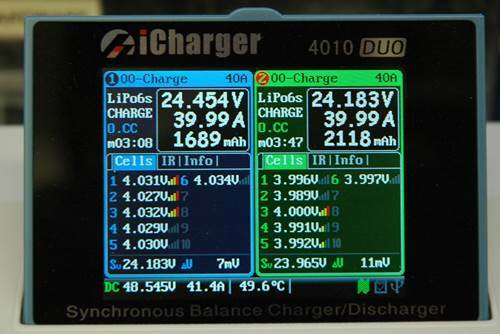 During our correspondence, somehow the topic of my iCharger 4010 Duo powering dilemma came up. 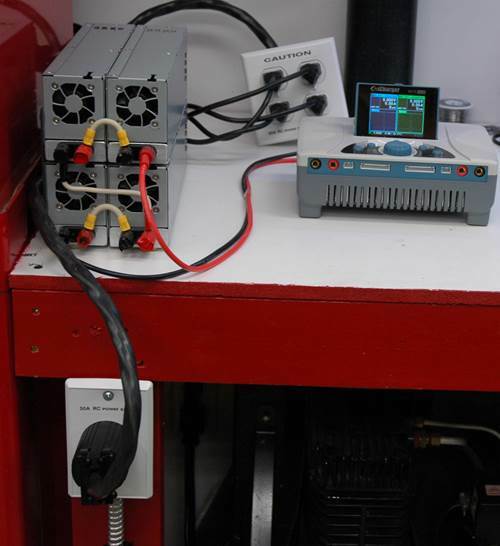 Mike, as luck would have it (using his extensive electrical and computer engineering know how), had been working on a modular RC power supply system that could fill his power needs, mine, and many other RCer's at not only an affordable price, but one that could also run on a normal 120VAC supply voltage. I jumped at the opportunity and have had the good fortune to stumble onto these awesome RC power supplies. So what is a modular RC power supply? What makes Mike's 2ZO-RC server supplies so unique is the modular feature. Simply put, you can economically and easily add multiple supplies together in series or in parallel to increase the output voltage, amperage , or both, exactly the same way batteries can be hooked up in series or parallel to increase the voltage and capacity. This is something you can't do with most off the shelf power supplies. The overall flexibility you get is very appealing and hard to ignore giving you many options. As a newbie, you can start out with one quality RC power supply very inexpensively. Then as and if your charging needs grow or change (either with more chargers or a more powerful one), you can just purchase and modify additional server supplies as required, again at a very reasonable cost. As a more advanced electric RC'er, you can have several modified RC power supplies all hooked together to give you one big powerful RC power supply for your high power charger or separate them to power several smaller battery chargers. No one time huge RC Power Supply expense or additional huge expenses; just add or subtract power as you need it and grow your supply power over time. As an advanced user, the other thing that really appeals to me is if one of these inexpensive server power supplies fail, I'm not out of commission like I would be if an expensive single power supply let out the "magic smoke"; I could still charge all my batteries with the remaining good one/s, just not as quickly. This also makes a repair/replacement should it happen very economical. We are no longer forced into purchasing another expensive power supply, we can just purchase a single lower cost replacement one to replace the failed unit and be back at full charging capacity again. All I know is I sure wish these 2ZO-RC supplies were available when I was getting into electric powered flight. In the long run, they would have saved me a lot of money and time while giving piece of mind knowing without question, no matter where my electric RC journey took me, I would have an RC Power Supply that would keep up to my changing needs. Single supply powering an iCharger 106B, 206B, or 208B. 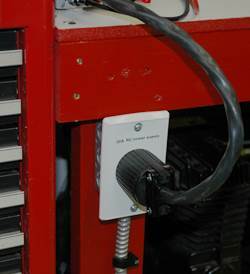 Two Supplies hooked in series powering an iCharger 306B, 3010B, or Power Lab 6. Four Supplies, two pairs hooked in series to power two iCharger 306B's, two 3010B's, or two Power Lab 6's. Four Supplies all hooked in series powering an iCharger 4010 Duo. When hooking modified computer power supplies up in series, you add the voltages and Watts but the Amps will remain the same. For example two supplies configured together in series will give you 24VDC @ 47A proving up to 1150W of power. When hooking modified computer power supplies up in parallel, you add the Amps and Watts, but the voltage will remain the same. Two supplies configured together in parallel will therefore give you 12VDC @ 94A again providing up to 1150W of power. For my iCharger 4010 Duo, I have four modified computer power supplies configured together in series giving 48V @ 47A, providing up to 2300W of power. This enables me to run the 4010 Duo at full capacity and finally be able to para-charge twelve 6S 5000 mAh LiPo packs from a 50% storage state to fully charged in under 30 minutes - WOW! Mike starts out with a high quality, industrial grade Hewlett Packard DPS 600PB server computer switching power supply rated at 12VDC @ 47A providing up to 575Watts of power output. A dual terminal (positive and negative) that will accept 1/4" fork connectors and 4mm banana plugs is then installed. The required "configurable" electrical modifications inside are performed along with the addition of a removable negative terminal chassis grounding tab (an important & necessary safety feature). The cooling fan operation is also modified so it won't run at maximum speed all the time. Its speed is now variable dependent on internal temperature and electrical load. This makes the fan very quite in comparison to other RC power supplies I have. Being designed for high-end computer server use, these DPS 600BP supplies can be stacked either vertically or side by side without overheating issues. To take up as little bench real-estate as possible, I have stacked mine in a 2X2 configuration. Even with them all working at near full capacity powering the 4010 Duo para-charging on both channels at 40 amps each (80 amp total), these converted server power supplies barely get warm. Over temperature protection is of course a standard safety feature as is over current protection, short circuit protection, and over & under voltage protection; making these power supplies very goof proof (perfect for yours truly). Okay, I know this is a question many people will have since I had it as well. "How is it possible to hook four DPS 600PB power supplies together (all pulling about 575 Watts each totaling 2300W) under full load and not trip the typical 15A house circuit breaker"? For those that didn't know this, a 120V 15Amp house circuit can handle up to about 1440 Watts of sustained power usage before the circuit breaker starts tripping. In theory, the number is actually 1800 Watts (120V x 15 Amps) but electric load calculations on typical circuit breakers are based at 80% sustained maximum load (80% X 1800 = 1440W). So it's perfectly fine to plug two DPS 600PB power supplies into the same 15A circuit and use them to full capacity as the total Wattage will be around 1150 Watts (provided of course there are no other high Wattage items sharing that same circuit that would push the power load over 1440 Watts combined). A dedicated 15A receptacle on it's own circuit is the best option if you are unsure what other items may be sharing the circuit. This is were it gets a little more complicated. Now, I must emphasize here I'm not a licensed electrician. Moreover, electrical codes vary from state to state and province to province. This information is just to give you some very basic ideas of how to power 3 or more supplies. If you don't have a good working knowledge of electricity and the residential electrical code in your particular area, please contact a licensed electrician and they can help you out. You could plug three modified server power supplies at full capacity (1725W total) on a 120V 20A circuit (80% circuit breaker rule calculates out to 1920W available). Most newer homes will have a few 20A 120V circuits. 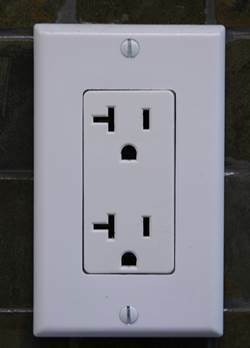 20A kitchen counter plugs for example are getting more and more common in new home construction. The utility room or garage will generally have a 20A circuit as well for powering a central vacuum system. 20A 120V duplex receptacles look just like 15A ones, but the left vertical slots will also have a horizontal slot making it look like a side ways "T". It wouldn't hurt of course to check at your circuit beaker box that the 20A receptacle you plan on using is indeed controlled by a 20A circuit breaker. I have seen a few DIY electricians install 20A receptacles on 15A circuits for example. You can' t just fire a 20A breaker in either because 15A wiring is 14 gauge and 20A needs 12 gauge to prevent the wiring from overheating. 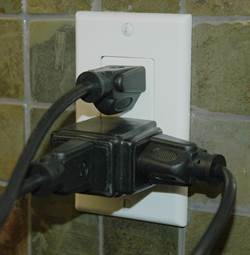 The next obstacle to overcome powering three RC power supplies from a single 20A duplex receptacle is of course there are only two plug receptacles and you have three plugs from your three supplies. The obvious work around is to plug one of the supplies into one of the duplex plugs, and then use a plug expander in the other plug for the other two supplies. A third option would be to power two of the supplies off one 15A circuit and the third supply off a separate 15A circuit. The potential problem here is if one circuit breaker trips for some reason, it will cut power to one or two of the supplies and leave the other one/s still powered up. This two 15A circuit powering option will also work with four 2ZO-RC supplies (two supplies hooked to one 15A circuit and the other two hooked to another 15A circuit); but again, the potential of one breaker tripping shutting down two of the supplies exits so it's less than ideal. I actually did power my four server supplies at first this way (using two separate 15A circuits) until I installed a dedicated 30A 120V receptacle in the work shop. Yes, I know one of my issues with getting a 240V power supply was the expense of installing a dedicated 240V line to the workshop so how is this any different? Well, it's less expensive to run a 30A 120V line (10/2 wire instead of 10/3), it only takes up one circuit breaker space instead of two, and I could do it myself. I then built a quad receptacle with two standard 15A duplex plugs in a 2 gang utility box. I used 30A rated 10 gauge wire with a 30A 120V twist-lock plug on the end that plugs into the new 30A twist-lock receptacle in the shop. My quad receptacle creation here is not exactly code, but it's the workaround I came up with and is much better than powering four 2ZO-RC power supplies off two separate 15A circuits in my opinion. 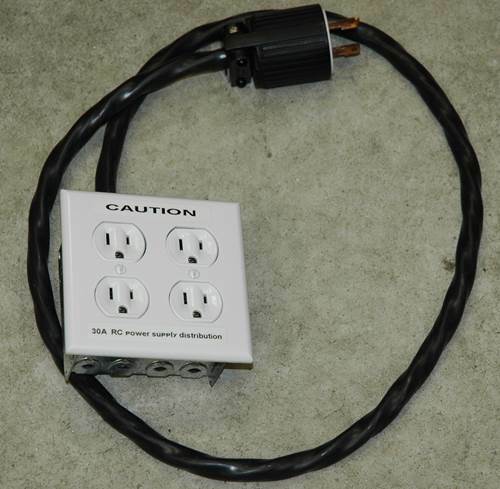 I can if I choose also plug this 30A plug and quad receptacle creation of mine into the 30A 120V outlet on the generator should I decide to take the geni out to the flying field (which I really hope I never ever have to do). May as well go back to fuel powered flight if I ever get that desperate. The other option would be to install a 2 gang dual 120V 15A duplex receptacle with each duplex receptacle wired to twin 15A breaker. This is essentially the same thing as powering the four supplies from two separate 15A circuits, but the big difference here is the twin beaker is mechanically tied together so if one half of it trips, it takes the other one out as well and will shut the power down on all 4 supplies. Powering These Computer Server Supplies with 240 VAC. These supplies will of course also work on 220/240V. They automatically detect the input voltage and can run on 240V without any modifications which is pretty neat. No messing around with jumpers or hidden switches. Powering them from 240V (especially four of them) is likely a better way to do things than what I have done since you don't have to run on as high a current. Double the voltage and you effectively cut the current requirements in half (2300W divided by 240V = 9.58 Amps). Again, this information is for enlightenment only and in no way is intended to be a "how to guide". Please seek out the services of a licensed and qualified electrician if you are not 100% sure of what you are doing when powering more than three supplies together. 30 Amps @ 120VAC is serious current & voltage that will KILL! 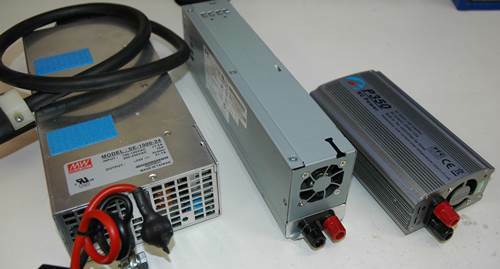 Pushing aside the fact that modified server power supplies are the only modular supplies that can grow with you; they are also roughly 1/3rd the cost of similar rated RC power supplies. 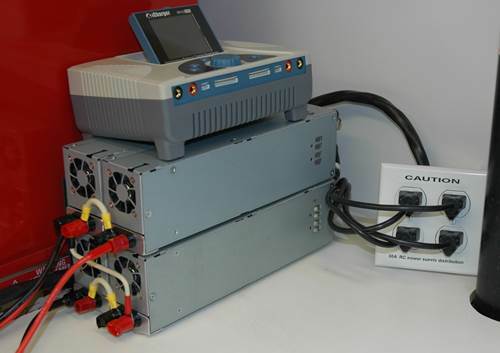 Furthermore, these are industrial units designed specifically for continuous 24/7 operation in demanding server computer environments requiring higher end safety and protection features making them much more robust than simple RC grade power supplies. Put all that together and you get unmatched RC power supply value. 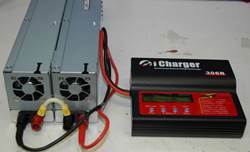 Lastly, if you happen to also have an iCharger 4010 Duo or are seriously considering getting one yet want an economical way to power it; four inexpensive used server supplies configured in series work impressively well at about quarter the cost of getting a huge 50V 2000W supply and you won't need a 240V source if you don't want to go to that expense. Those were the two main features that sold me. The quiet operation and ability to also configure them to run my less powerful chargers as well were sweet icing on the cake bonuses! Again, these already modified DPS 600PB server power supplies are no longer available through 2ZO-RC, but you can modify your own quite easily with easy to get, inexpensive parts.